Beautifully realistic cognitive card, with real pictures and text, let children easily understand a variety of animals, with bright colors, stimulate the baby's visual development, while learning literacy, brain development and improve IQ! Select 42 cute animal realistic map cards to make your baby smart and improve IQ! Contained photo of cute animals familiar with 42 kinds of children including elephants, giraffes, whales, dolphins, penguins, sparrows, etc. Draw a word card to give your baby the closest cognitive learning to nature. thick paper card material that is not easy to break, it will not cut children and it is convenient to carry, so that children can watch pictures at any time. 3. Bilingual learning is easy to read, so that children can learn intelligently. The back of the card has Chinese and English bilingual names, and is accompanied by phonetic transcription. The words are clear and easy to read, so that children can learn while understanding various animals. Literacy, smart and improve IQ! Dama and dad can use the card to play the treasure hunt with the baby, with the question "Where is the giraffe? ", guide the baby to find it from 42 cards. The correct picture, parent-child interaction promotes the development of the baby's whole brain. 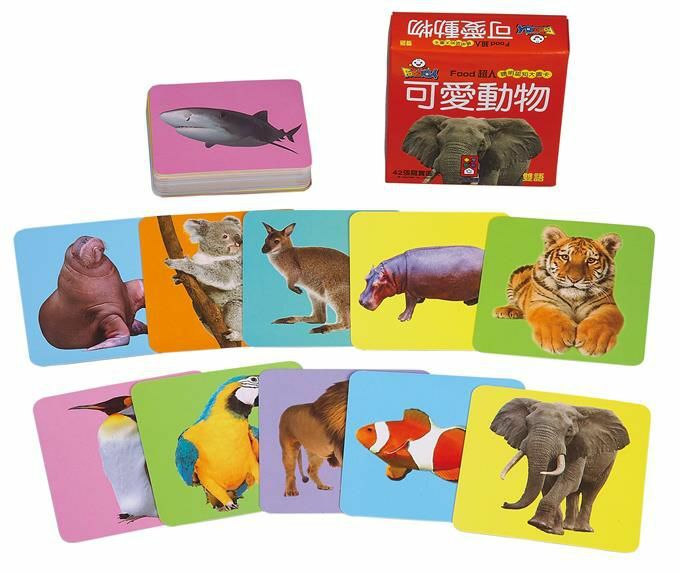 Small and realistic cognitive card, with real pictures and text, let the children easily understand a variety of animals, with bright colors, stimulate the baby's visual development, while learning literacy, brain development and improve IQ! ◆42 cute animal photos that truly show the animal's natural appearance. ◆Positive pictures, back and forth Chinese and English bilingual names, let the children's graphics and texts easily learn. ◆The font is clear and easy to read, with bright colors to stimulate the baby's visual development, while learning literacy. ◆Tear unbreakable thick paper card, light and convenient, safe and good to carry. Publisher: Windmill Books Publishing Co.